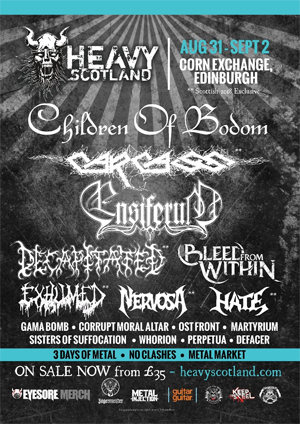 HEAVY SCOTLAND 2018 completes its lineup announcing the final two headliners, CHILDREN OF BODOM, and ENSIFERUM. They're joined by BLEED FROM WITHIN for the festival at Edinburgh's Corn Exchange, from Friday 31 August to Sunday 02 September. Tickets from only £35. Under-18 tickets are available now at just £35 and student Weekend tickets at just £50. The festival have also announced their partnership with Haymarket Hub and Code Hostel. Buy the hotel ticket on http://www.heavyscotland.com/hotel-deals/ and you receive a discount code for the weekend. The news follows a highly impressive first year from Heavy Scotland, placing Edinburgh on the international metal map. Headliners BEHEMOTH and ARCH ENEMY topped a stellar bill, which also included the likes of FLESHGOD APOCALYPSE, DESTRUCTION, FINNTROLL, HAVOK and more. Garnering local and international acclaim, Heavy Scotland is fast becoming Scotland's national heavy metal festival, and is the largest of its kind in the country's capital of Edinburgh. Borne from a love of all things loud and with a passion for the local scene, Heavy Scotland is an event deserving of the attention so far received.